Mahindra Ecole Centrale(MEC), an Indo-French engineering college, hosted Sugata Mitra, an eminent educationist, on the campus for a talk on the “Future of Learning”.This talk, a part of the Thought Leadership Series at MEC, showcased to the students a paradigm shift in education with the focus shifting from formal schooling to Self organized learning Environments and Cloud Learning. Mahindra Ecole Centrale’s Thought Leadership Series is a series of talks and events focused on exposing the students to the thinking of the leaders in different categories, be it in Engineering, Business, Social Service or Education. MEC has been fortunate to have on campus leading luminaries like the Late Dr. APJ Abdul Kalam, Sir David Payne(the Father of Internet telephony), Nobel Laureate Prof Serge Haroche(Nobel Prize in Physics 2012), among others, who have spent time with the students and shared their works with them. “We firmly believe that a students’ holistic development will happen only with them engaging with the leading lights in the world. It is our endeavor to expose our students to different aspects of life, Engineering and Business, so that their holistic development becomes a well established process’, says Dr. R. Shrivastava, Director, Mahindra Ecole Centrale. "It was a privilege to have a leader such as Dr. Mitra in our midst. We are sure that our students were impressed by the sheer brilliance of such a versatile intellect and his thought process", he adds. Prof. Sugata Mitra is a well known educationist and a Professor of Educational Technology at the School of Education, Communication and Language Sciences at Newcastle University, UK. He conducted the Hole in the Wall (HIW) experiment, where in the year 1999 a computer was embedded within a wall in an Indian slum at Kalkaji, Delhi and children were allowed to freely use it. The experiment aimed at proving that kids could be taught computers very easily without any formal training. Sugata termed this as Minimally Invasive Education (MIE). He is the recipient of many awards from India, the UK, USA and many other countries in the world. He won the TED Prize of US $1 Million in 2013 for his work. His interests include Children’s Education, Remote Presence, Self-organising systems, Cognitive Systems, Physics and Consciousness. and educational technology. 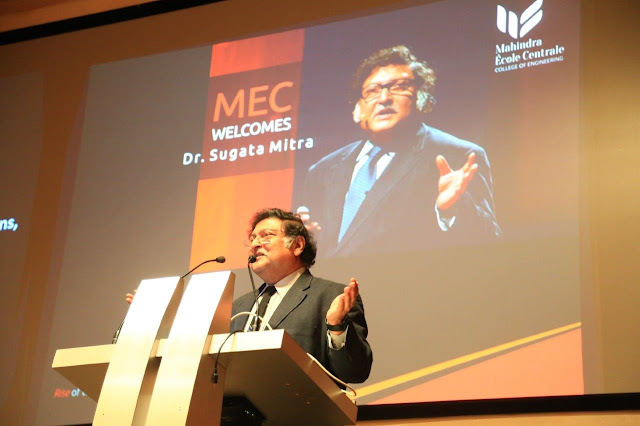 In his talk, Prof. Sugata Mitra took the students through the origins of, to the dematerialisation of institutions. From over 17 years of experiments with children's education, Prof. Mitra has reached a series of startling results – children, in groups, can form ‘self organising systems’ that results in emergent learning, they can achieve educational objectives on their own and read on their own. Finally, the most startling of them all: Groups of children with access to the Internet can learn anything by themselves. The mechanism of this kind of learning seems similar to the appearance of spontaneous order, or ‘emergent phenomena’ in chaotic systems. From the slums of India, to the villages of India and Cambodia, to poor schools in Chile, Argentina, Uruguay, the USA and Italy, to the schools of Gateshead and the rich international schools of Washington and Hong Kong, Prof. Mitra’s experimental results show a strange new future for learning. Prof. Mitra, used the 2013 TED Prize, to build seven ‘Schools in the Cloud’, where Self Organised Learning Environments (SOLEs) and a ‘Granny Cloud’ of mediators over the Internet, interact with unsupervised children. The results of thisthree-year study are not yet fully analysed, but Prof. Mitra presented some of the preliminary findings. He showed the students some glimpses of what schools should be for and what curricular, pedagogic and assessment changes will be required in the future. The talk was well received by the students community and the post talk engagement with a man as learned as Prof. Sugata Mitra left the students spellbound and completely enthralled. He opened up a completely new dimension of the learning system for all those present. Mahindra Ecole Centrale (MEC) college of engineering is an international technology school, that marks the foray of the USD 17.8 billion Mahindra Group into the higher education sector. Mahindra Educational Institutions, the wholly owned subsidiary of Mahindra Group’s IT venture, Tech Mahindra, collaborated with École Centrale Paris - now Centrale Supélec in 2014 to establish MEC in India. Ecole Centrale Paris (now Centrale Supélec) is one of the oldest and most prestigious engineering institutions in France with a heritage that goes back to nearly 200 years. MEC is approved by AICTE and Jawaharlal Nehru Technological University (JNTU) Hyderabad, a premier institution with academic and research-oriented courses. MEC offers a truly international programme with an inclusive focus on the Engineering, Social and Creative sciences, Liberal Arts, Philosophy and Humanities. It offers an environment of unique cultural immersion – of participants, faculty and staff. MEC offers international exchange study opportunities with mandatory global internships. The B.Tech degree at MEC is a research-driven program with close links to industry. A world class faculty, with a mix of industry-academic background, global exposure and research focus ensures that the content remains contemporary, aligned to the global business requirements.